They nurture the confidence of the organization to learn from itself – to enrich itself through purposeful divergence (many learning choices rather than One); the simple act of hearing voices other than that of the Leader. We sought prediction and control, and also charged leaders with providing everything that was absent from the machine: vision, inspiration, intelligence, and courage. They alone had to provide the energy and direction to move their rusting vehicles of organization into the future. With so much evidence supporting participation, why isn’t everyone working in a self-managed environment right now? This is a very bothersome question because it points to the fact that over the years, leaders consistently have chosen control rather than productivity. Rather than rethinking our fundamental assumptions about organizational effectiveness, we have stayed preoccupied with charts and plans and designs. We have hoped they would yield the results we needed but when they have failed consistently, we still haven’t stopped to question whether such charts and plans are the real mute to productive work. We just continue to adjust and tweak the various control measures, still hoping to find the one plan or design that will give us what we need. An emphasis on structure, processes, implementation of new models. A deemphasis on relationships, vulnerability, open-access to information as shared capital (Argyris). School leaders shake their heads at teachers that won’t change their ways, and may see revamped hiring practices as the only end-run “solution” around the blockade of the old guard. But how frequently do they ask teachers for their ideas on the road ahead? How often do they invite teachers to practice “blank canvas” thinking about what could be? How often do they ask for feedback on professional development? The paradox only becomes richer, and more intractable, as we see leaders attempt inclusion, attempt to loosen their grasp on how the people in their organization interrelate, and – upon seeing that uptake is slow, or that people are resisting (a favored term – one that clearly puts us in the right) – quickly fall back to what Wheatley so tellingly describes above: Command and Control. They seek to expedite “change” processes where information on the why and how of the change taking place is limited (by design); they have diminished contact with the people they are charged with leading, and those people quickly get the hint; mistrust grows and the leader’s credibility and influence wane. Maybe it was the recent Fall CUE conference that stirred these waters a bit. Perhaps it was sitting next to one of the EdCamp co-founders Kristen Swanson (smile ablaze alongside Todd Feinberg) during a session on how to enable more learning and sharing within (and between) our schools (shared notes doc here). The impetus behind the EdCamp movement was in large part a response to the increasingly painful disconnect between a rigidly imposed vision for “professional development” (as facilitated by formal leaders and outside experts) and the desire for teachers to exert choice in their own learning and growth. It is very in vogue these days (happily so) for school leaders to act as proponents for more student voice in the classroom, more choice in what they learn and how. Yet in the same breath the idea of a teacher-led EdCamp for their site or district is brushed off as lacking focus or able facilitation. The paradox deepens. 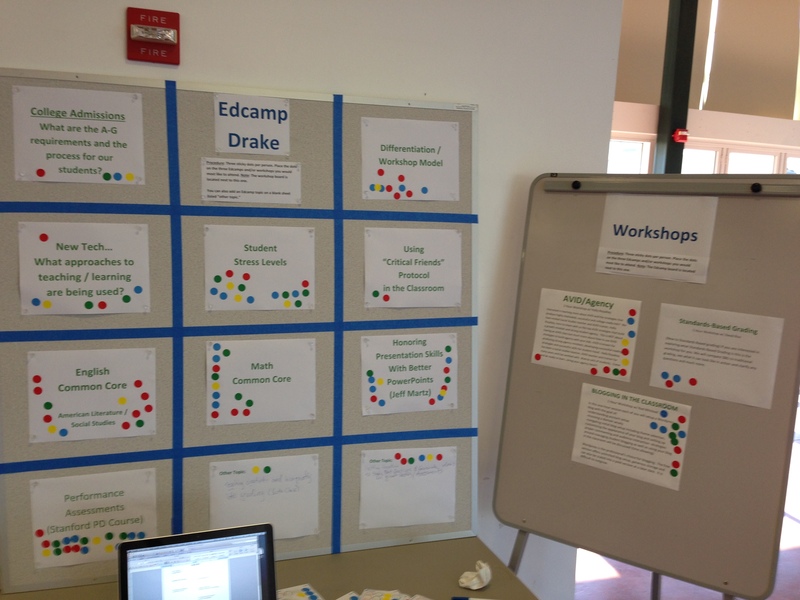 So even more incredible that schools like Sir Francis Drake High School (my former employer) completed their second site-based “EdCamp” this year (session board shown above). These were not all-day affairs but rather a few hours dedicated to having teachers get together to share, learn, and network. Part of the power of the EdCamp model is that there isn’t a need for an official facilitator; the point is that everyone in the room has an opportunity to share their knowledge – or questions – about a given topic. Site leadership has embraced this format as a tool for deepening work already underway – even offering more formal workshops and presentations due to the demand for them. Marin County Office of Education leadership is a wonderful example of positive change sometimes starting from “the top,” organizing EdCamps for teachers (two to date) and administrators. In fact, Superintendent of Schools Mary Jane Burke invited Kristen to address the fall meeting of all county administrators. 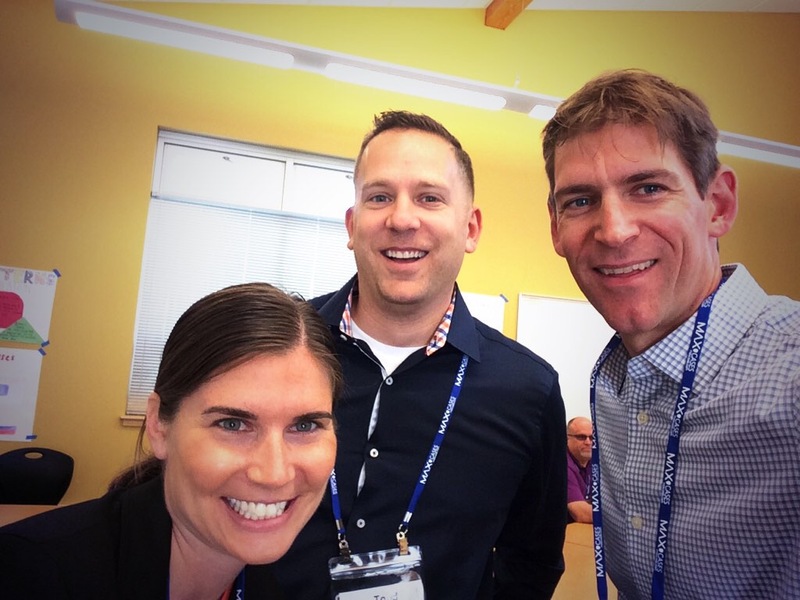 The tweet below comes from the recent admin “unconference” session where we discussed the idea of EdCamp as site-based PD. In that respect, leadership is also dealing in hope for the adults with whom we work. If leadership becomes an exercise in fault-finding and identifying deficits rather than spotlighting strengths, then people in our organizations will duly (dutifully) follow suit in adopting a pessimistic view of opening their doors and minds to others. If “going first” represents a critical leadership stance – modeling the mindsets and behaviors they believe will help their organizations fulfill their purpose and potential – then educational leaders must “go first” in relinquishing their firm control of teacher PD and instead circle up in an open-source learning session alongside them. Posted in Leadership, Personal Growth and Learning, Professional Development, School Culture, UncategorizedTagged Chris Argyris, confidence, Control, Edcamp, Kristen Swanson, professional development, WheatleyBookmark the permalink. You can replace the word “leaders” with “teachers” and this article makes perfect sense. Spot on Sensei. Arigato.